It’s hard to believe: we’re now just one short weekend away from the big ticket astronomical event for 2017, as a total solar eclipse is set to cross over the contiguous United States on Monday, August 21st. Celestial mechanics is a sure thing in this Universe, a certainty along with death and taxes that you can bet on. But there are still a few key question marks leading up to eclipse day, things that we can now finally make intelligent assumptions about a few days out. Although totality slices through the U.S., partial phases of the eclipse touch on every continent except Antarctica and Australia. Credit: Michael Zeiler/The Great American Eclipse. First up is solar activity. If you’re like us, you’ll be showing off the Sun in both visible and hydrogen alpha as the Moon begins making its slow hour long creep across the disk of Sol. First, the good news: sunspot active region AR 2671 made its Earthward debut on Tuesday August 15th, and will most likely stick around until eclipse day. The bad news is, it most likely won’t have lots of friends, as solar cycle #24 begins its long slow ebb towards the solar minimum in 2019-2020. Likewise, I wouldn’t expect to see any magnificent sprouting red prominences in the solar chromosphere in the seconds bracketing totality, though we could always be pleasantly surprised. The shape of the field lines of the solar corona, one rotation prior to the August 21st total solar eclipse. Credit: The National Solar Observatory. NASA will be chasing the umbra of the Moon with two converted W-57 aircraft during the eclipse, hoping to unlock the “coronal heating paradox,” image Mercury in the infrared, and hunt for elusive Vulcanoid asteroids near the eclipsed Sun. The view of the corona during totality? This computational model was derived from NASA SDO data during the last solar rotation. Credit: Predictive Science Inc. The line up of the planets, bright stars and the eclipsed Sun during totality at 2:37 PM EDT as seen from Franklin, North Carolina. Credit: Stellarium. Also, be sure to scan the local horizon for a strange 360 degree sunset as you stand in the umbra of the Moon. An “eclipse wind” may kick up, as temperatures plummet and nature is fooled by the false dawn, causing chickens to come home to roost and nocturnal animals to awaken. I dare you to blink. 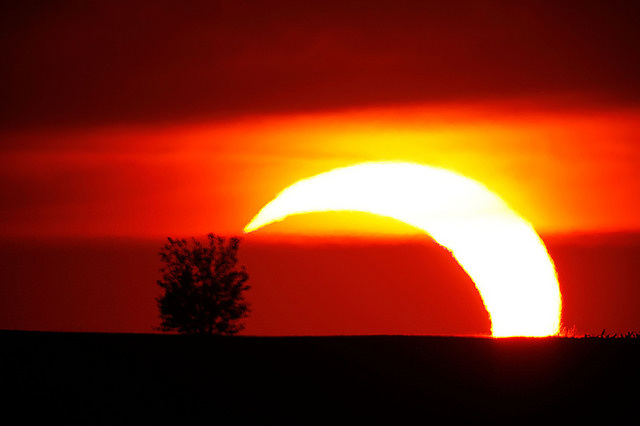 Totality can affect the human heart as well, causing tears to cries of surprise. Here’s an interesting, though remote, possibility. 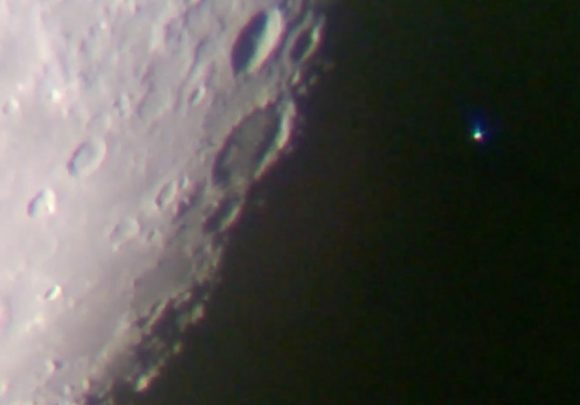 Could a sungrazing “eclipse comet” photo bomb the show? Karl Battams (@SungrazerComets) raises this question on a recent Planetary Society blog post. Battams works with the Solar Heliospheric Observatory (SOHO), which has discovered an amazing 3,358 comets crossing the field of view of its LASCO imagers since 1995. Comets have been discovered during eclipses before, most notably in 1882 and 1948. To be sure, it’s a remote possibility this late in the game, but Battams promises to give us one last quick look via SOHO the morning of the eclipse on his Twitter feed to see if any cometary interlopers are afoot. The possible search area for Kreutz group sungrazers during the August 21st eclipse. Credit: Karl Battams. A look at cloud cover prospects over the eclipse path as of August 17. Credit: Michael Zeiler/Great American Eclipse/ESRI. The NOAA also has a fine site dedicated to weather and cloud coverage across the path come eclipse day, and Skippy Sky is another great resource aimed at sky viewing and cloud cover. Credit: The Virtual Telescope Project. Also be wary of heatstroke, standing out showing folks the partially eclipsed Sun for an hour or more. It is August, and heat exhaustion can come on in a hurry. Be sure you have access to shade and stay cool and hydrated in the summer Sun. Finally, eyes from space will be watching the eclipse from the International Space Station as well. Looking out at Monday, the ISS will pass through the penumbra of the Moon and see partial phases of the eclipse three times centered on 16:32, 18:20, and 20:00 Universal Time. The center time is particularly intriguing, as astros have a chance to see the dark umbral shadow of the Moon crossing the central U.S. This also means that eclipse viewers on planet Earth around southern Illinois might want to glance northward briefly, to spy the ISS during totality. 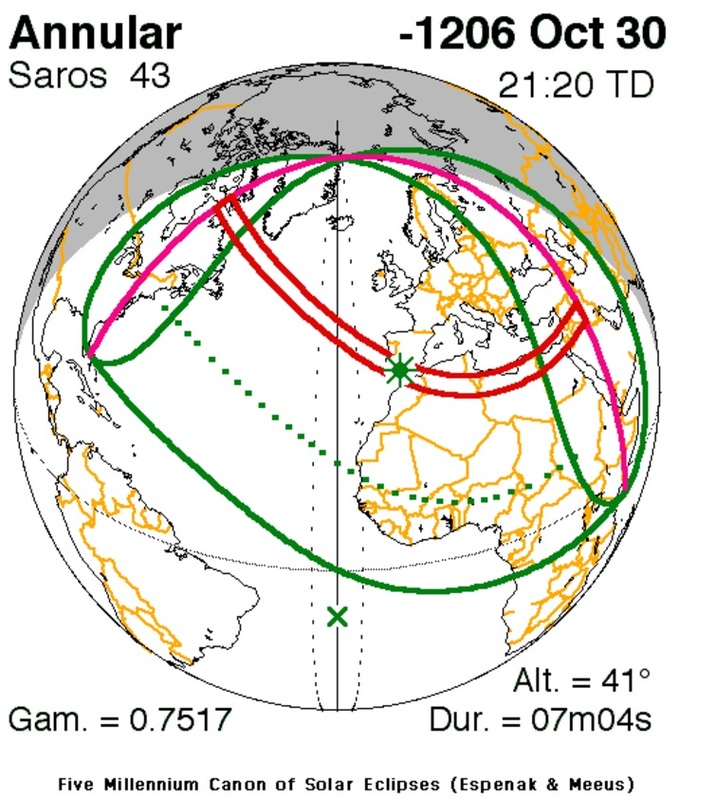 Also, viewers along a line along southern central Canada will have a chance to catch an ISS transit across the face of the partially eclipsed Sun around the same time. Check CALSky for details. Three passes of the International Space Station versus the path of of totality. The inset shows the view of the partially eclipsed Sun as seen from the ISS. Credit: NASA/JSC. We’ll be at the Pisgah Astronomical Research Institute in southwestern North Carolina, for a glorious 104 seconds of totality. We expect to be out of wifi range come eclipse day, but we’ll tweet out key eclipse milestones as @Astroguyz. We also plan on writing up the eclipse experience with state-by-state testimonials post eclipse. Perhaps, the August 21st total solar eclipse will bring us all together for one brief moment, to witness the grandest of astronomical spectacles. We’re lucky to share a small patch of time and space where total solar eclipses are possible. Good luck, clear skies, and see you on the other side early next week! Read more about the August 21st total solar eclipse and the true tale of Edison’s chickens and the 1878 eclipse in our free e-book: 101 Astronomical Events for 2017. The oldest video featuring totality? Read the mystery of the August 21st, 1914 over war torn Europe and this amazing video over Sweden. Eclipse… sci-fi? Read our original eclipse-fueled tales Exeligmos, Shadowfall, Peak Season and more. Read our CNN Op-Ed, Why We Chase Eclipses.